Everyone’s favourite at Christmas, the reindeer, the trusty companions that ensure Santa gets everywhere he needs to be. The cards featured in this blog all feature these gorgeous, hard-working animals in different styles and scenarios – all of which are lovely and perfect for corporate, business, company or personal use. 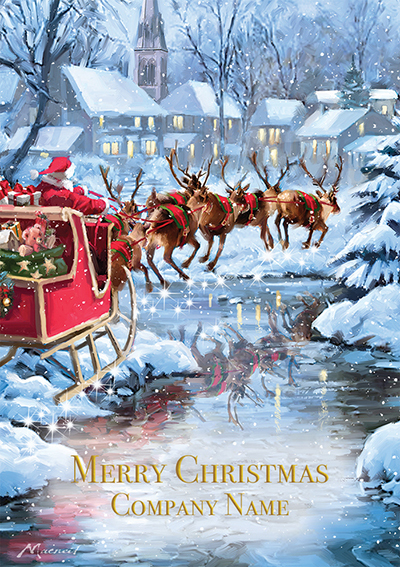 This gorgeous card features a lovely painting of Santa and his reindeers on their way to deliver presents. It truly captures the magic of Christmas as the reindeer’s glide over a frozen river that reflects their bodies and the lights from the houses ahead. 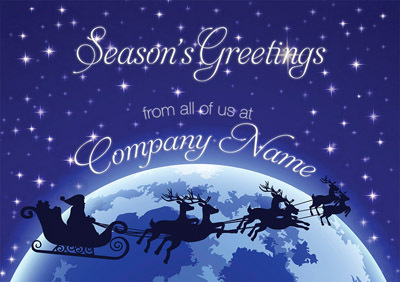 You can front personalise this card by adding your company name to the front of the card to make it even more special. 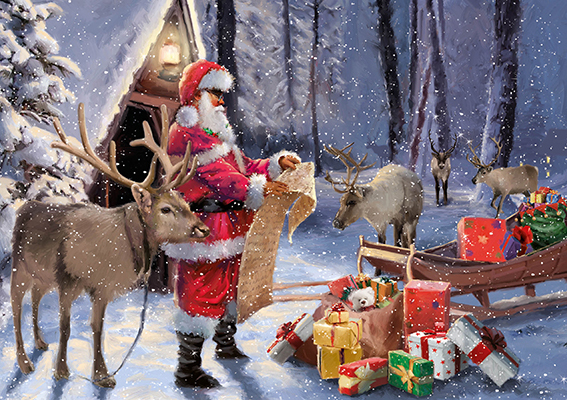 This card features Santa loading his sleigh with lots of presents, checking his list as he does, while his reindeer patiently wait for him to finish. This is a beautifully painted card design with stunning detail and a high gloss finish, it also includes a paper insert. This card design is a bit more contemporary than the first two which feel quite traditional in comparison. 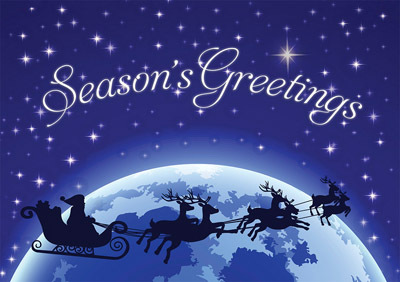 A simple silhouette of Santa and his reindeer soaring through the night sky to their next destination. 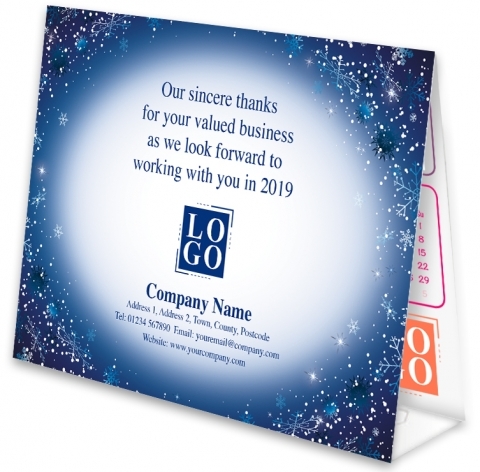 You can front personalise this card by adding your company details to the front cover, giving it a more personal touch. 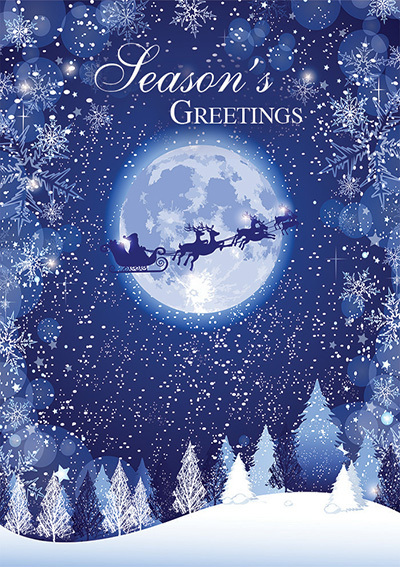 Another card which features this same silhouette is The Night Before Christmas. 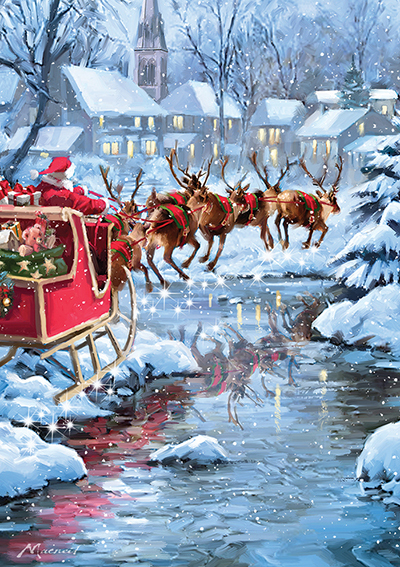 A similar concept to Around the World, The Night Before Christmas features Santa and his reindeers on their way to make deliveries before Christmas Day. 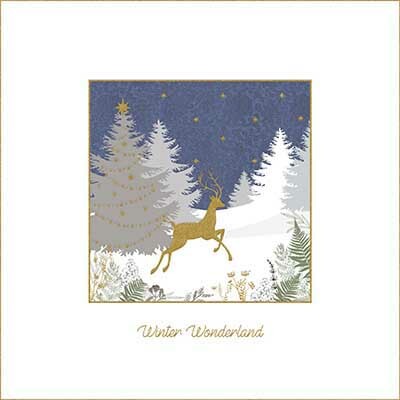 This design is nicely framed by trees and snowflakes, with the moon drawing you into the centre of the card. 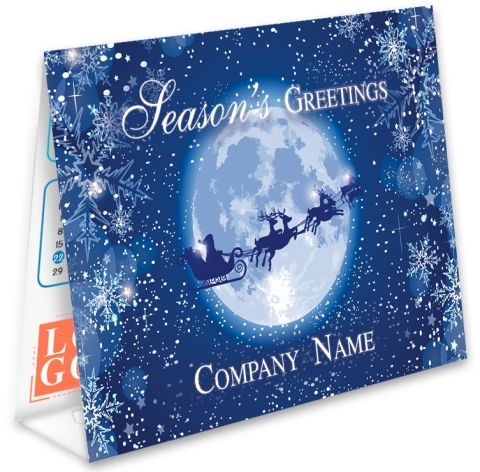 This card is also available with front personalisation where you can add your company name to the front. 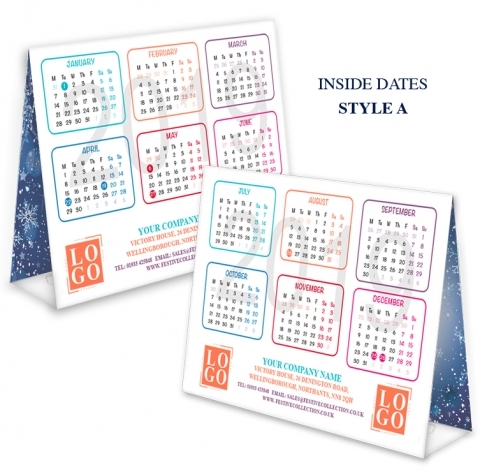 Personalised company calendars are an effective promotional giveaway item for all businesses. 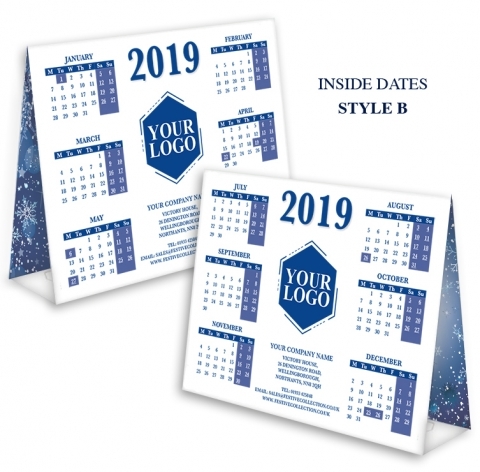 Keep your company name at the front of your customers mind all year round by personalising your calendar with your company name, details and logo. These card calendars act as a card but can be flipped inside out and turned into a desk calendar for the rest of the year. 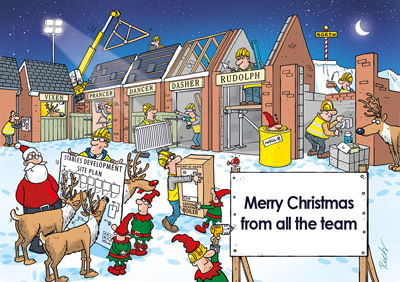 This card features a comical illustration of stables under construction for Santa’s reindeer. It’s all hands on deck with even the elves lending a hand in the building work. My favourite part of this card is the elf that has fallen asleep in a roll of insulation material. 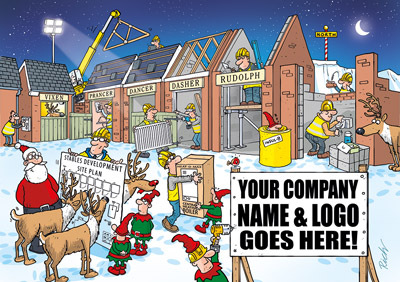 This card design is perfect for companies in the building and construction industries and can be personalised with a company name and logo on the front. 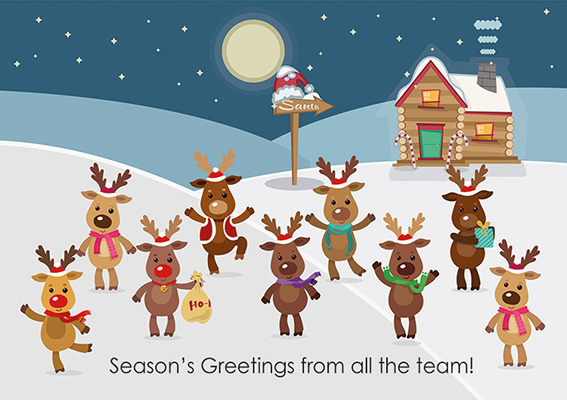 These lovely cartoon reindeers will certainly bring a smile to your client’s face, especially if you front personalise it! 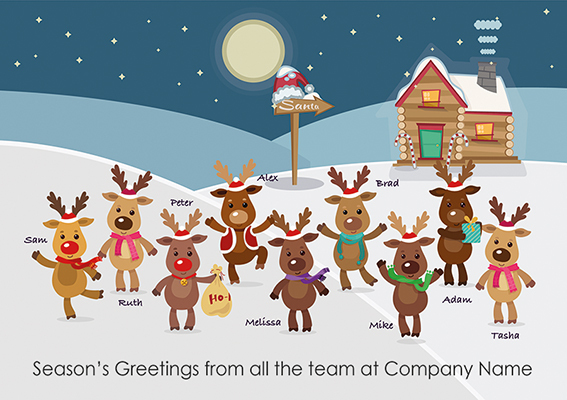 By front personalising this card you can add your company name, choose any number of reindeer you need and add employee names. Just let us know all the details you’d like on the front cover by filling out the Special Instructions box when you order online. This lovely card is a rather simple design but has a lot to offer. 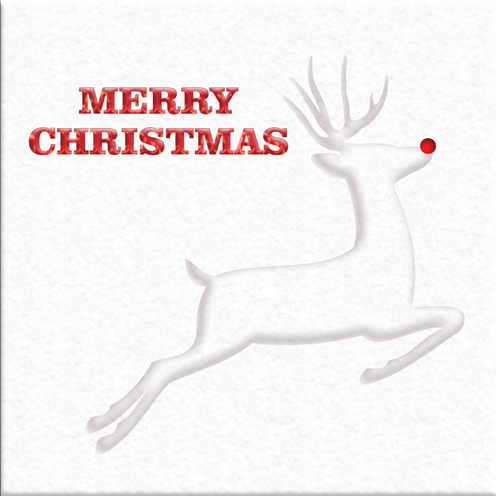 It’s on textured board with ‘Merry Christmas’ in a gorgeous red foil, Rudolph is embossed into the card and has a die-cut nose with a red insert showing through. It’s the kind of card you want to pick up and look at closely and appreciate the work that’s gone into it. This card has some beautiful detailing with the leaves flowers at the bottom of the design and it’s faintly patterned blue sky. It also features embossed gold foiled elements with different areas reflecting the light and a paper insert. This card is sophisticated and modern and would look lovely sitting on a client’s desk or mantel. All of our cards come with free peel and seal envelopes, free UK mainland delivery, free proofing and amendments and a free gift. We also offer the opportunity to support a charity with all of our cards, 10p from the sale of every card you buy will go to your chosen cause.